Leigh Griffiths believes he can realise his Champions League ambitions at Celtic after signing an extended deal that ties him to the club until 2021. Griffiths says he is happy to stay with the Scottish champions, who he believes are a bigger club than "three quarters" of the English Premier League. "I want to win a lot of trophies, but most importantly I want to play in the Champions League," he said. "I don't see why I really need to leave this club." With Celtic falling at the Champions League qualifying stages for the past two seasons, Griffiths has yet to sample Europe's premier club competition, but the 25-year-old is confident he will do that with the Glasgow side. "I've been there at a couple of Champions League nights here - I don't think there's a better atmosphere in European football and I want to sample that for myself," he said. "That's the main aim, especially for the boys that haven't played there before. "I don't see why I really need to leave this club. This is a bigger club than three quarters of the English Premier League." 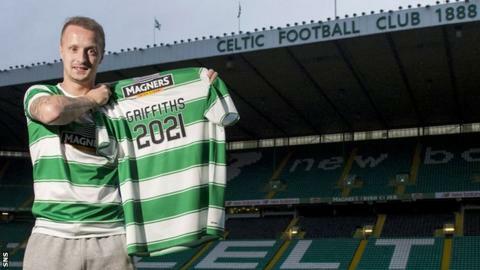 Griffiths initially struggled to hold down a place in the team after arriving in January 2014. But he has flourished this season and is top scorer in the Premiership with 14 goals. He can trace back to the moment he believes turned around his Celtic career under manager Ronny Deila. "A year ago, I was a bit part player, I made a few sub appearances but hardly started a game," he said. "He asked if I wanted to go and play the reserve game away to Sunderland - that was the turning point. "He said to me the day before I didn't have to go, I could have trained with the first-team squad. But I wanted to play games and be ready for when I was called upon. "I went down there, played well, scored two goals and haven't really looked back since. "If you look at me beforehand, still doing daft stuff off the field and I've kind of quietened down a bit now and I had to because I was almost staring the exit door in the face. "After I sat down with the manager and spoke to him about how he wanted me to change, it really hit home about how big a club this is and how much I didn't want to leave." Having started out at Livingston, Griffiths enjoyed a successful spell with Dundee. His record of 28 goals in 48 appearances at Dens Park brought him to the attention of Wolverhampton Wanderers, who took him to England in 2011. He never truly established himself at Molineux, but two loan spells with Hibernian marked Griffiths out as a striker of considerable potential. In his second spell at Easter Road, he was named the SPL Player of the Year and PFA Scotland Young Player of the Year after scoring 28 goals in the 2012/13 season. He returned to parent club Wolves at the end of that campaign, but then Celtic manager Neil Lennon was sufficiently impressed to bring him to Celtic Park on a four-year deal in January 2014.